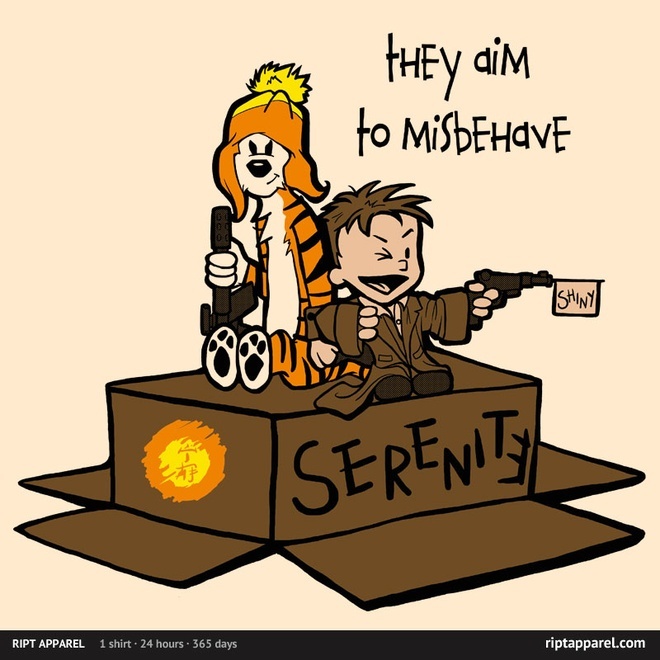 It seems strange, but for the longest time I thought I was in the minority with my unwavering allegiance to and reading of Calvin and Hobbes. I know now I'm not alone, that there are countless C&H fans out there and more being born every day. Even still, I would put myself up there as a top tier fan. One piece of proof: I quote this strip regularly - sometimes without even realizing it. True story: I had been saying "Careful. We don't want to learn from this," (or derivations thereof) for so long I'd forgotten the origin until Daily C&H Quote tweeted it recently. Full disclosure: I don't own ALL THE books, but I do own all the strips (found a list somewhere that named the books you needed for this). I've read my C&H books many many times, and they look like it. I don't really have a favorite, but I do lean towards The Calvin and Hobbes Tenth Anniversary Book, since Bill Watterson gave us wonderful background information about the characters and his creative process. 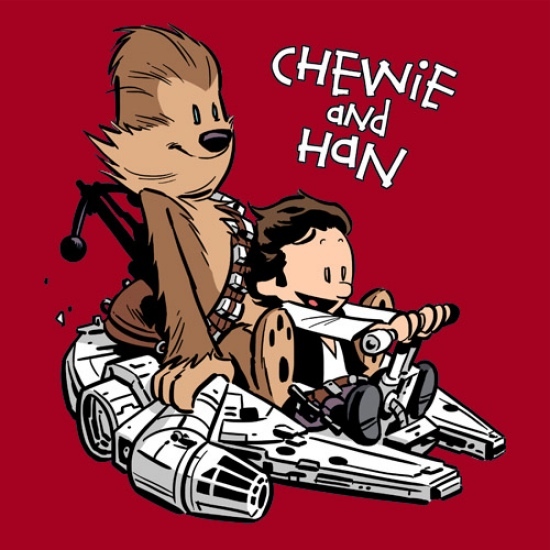 I bought this shirt, designed by Chris Wahl, from RedBubble, but it's no longer for sale. By Karen Hallion. I own other t-shirts with her art. And then there's this documentary that I simply must see. I'm even considering preordering the DVD now. So how about you. I must assume that you love C&H, otherwise you wouldn't have made it down to the end of the column. What do you love about the boy and his stuffed (or is he stuffed?) tiger? Have a favorite strip? Friends gave us the complete 3 volume set a few years ago, and I live watching my 9 year old pour through them, discovering all the fantastic moments that I'd forgotten, and adding Calvinisms to his vocabulary. 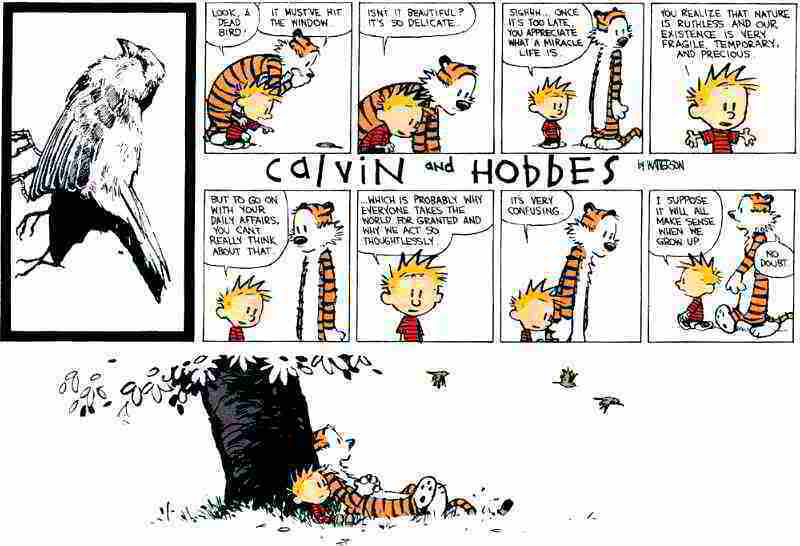 I love love LOVE Calvin and Hobbes and have my whole life. You described it perfectly: I love the mix between the erudite, deep messages and the goofy, silly fun.I could (and have) read the books over and over again and never get sick of it. I've been reading those since I was a child. I have every one of the books. When I found out my sister didn't know who they were (we're 14 years apart, and she didn't grow up with them like I did), I made it a point to buy her the boxed set for Christmas, expense be damned. She loved it. So yeah, I'm a fan. I even have a semi-recurring dream (maybe once every 2 years or so) that Bill Watterson writes one more book of original Calvin & Hobbes material, and I wake up severely depressed upon finding it was just a dream. Academic Freedom! Huh! What is It Good For?